HOUSTON – Republican Senators today indicated they are not moving forward with a vote on the Graham-Cassidy bill, which would have repealed and replaced the Affordable Care Act. 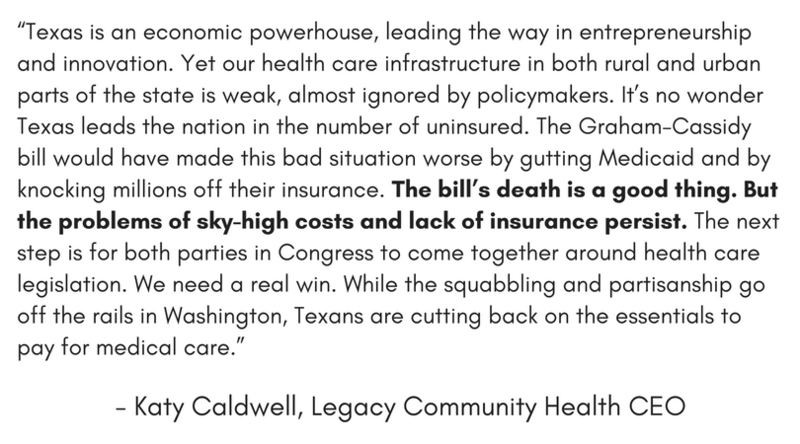 Legacy Community Health issued the following statement from CEO Katy Caldwell. Last week, the Texas Medical Center released a survey that found that more than 60% of Texans pay more out-of-pocket for health care than two years ago – more than any other state. More than half said they are cutting down on expenses, like on food and clothing, to pay for health care. Texas is home to 4.5 million uninsured, the highest in the country. Legacy Community Health, a not-for-profit Federally Qualified Health Center (FQHC), provides comprehensive care to over 150,000 community members, regardless of their ability to pay, at 29 clinics in Southeast Texas. The agency provides adult primary care, HIV/AIDS care, pediatrics, OB/GYN and maternity, dental, vision and behavioral health.